1895: born in Ôsaka. He is the second son of the actor Nakamura Karoku III. 1901: he makes his first appearance on stage at Kabukiza, where he receives the name of Nakamura Yonekichi II. June 1903: Yonekichi plays at the Kabukiza the role of Tsuruchiyo in the drama "Meiboku Sendai Hagi"; the role of Masaoka is played by Nakamura Shikan V.
January 1913: Yonekichi plays at the Shintomiza the role of Matsushima in the drama "Meiboku Sendai Hagi"; the role of Masaoka is played by Nakamura Kichiemon I.
April 1916: Nakamura Yonekichi II takes the name of Nakamura Tokizô III at the Ichimuraza, playing for the first time the role of Yaegiri in the drama "Komochi Yamanba". May 1917: Tokizô plays at the Suehiroza (Nagoya) the role of Yaegiri in the drama "Komochi Yamanba"; the role of Sakata Kurando Yukitsuna is played by Bandô Mitsugorô VII. May 1919: his father Nakamura Karoku III dies. March 1921: Tokizô and his eldest brother Nakamura Kichiemon I leave together the Ichimuraza. June 1921: Tokizô and his eldest brother Nakamura Kichiemon I the Shôchiku, a company producing Kabuki shows. April 1924: the Tokizô - Kichiemon duo perform for the first time, at the Asakusa Shôchikuza, the roles of the courtesan Kojorô and the smuggler Kezori in the drama "Koi Minato Hakata no Hitofushi". July 1924: Tokizô plays at the Hôrakuza the role of Otatsu in the drama "Natsu Matsuri Naniwa Kagami". 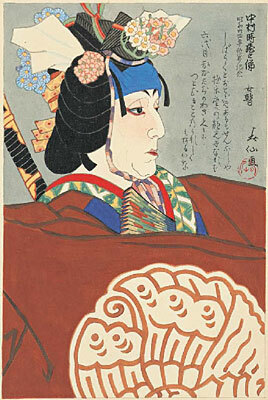 February 1926: Tokizô plays at the Hongôza the role of the courtesan Yûgiri in the drama "Kuruwa Bunshô"; the role of Fujiya Izaemon is played by Sawamura Sôjûrô VII. April 1926: Tokizô plays at the Hongôza the role of Okaru in the classic "Kanadehon Chûshingura"; the role of Hayano Kanpei is played by Onoe Kikugorô VI. May 1926: Tokizô plays at the Asakusa Shôchikuza the role of Yaegiri in the drama "Komochi Yamanba"; the role of Sakata Kurando Yukitsuna is played by Sawamura Gennosuke IV. March 1927: Tokizô plays at the Hongôza the role of Okinoi in the drama "Meiboku Sendai Hagi"; the role of Masaoka is played by Sawamura Sôjûrô VII. October 1927: revival at the Hongôza of Tsuruya Nanboku IV's masterpiece "Sakura Hime Azuma Bunshô", produced under the title "Kiyomizudera Azuma Bunshô", which has not been staged since 3rd lunar month of 1817; Tokizô plays the role of Princess Sakura [casting]. April 1928: Tokizô plays at the Meijiza the role of Chiyo in the "Terakoya" scene of the classic "Sugawara Denju Tenarai Kagami". His stage partners are Nakamura Kichiemon I (Matsuômaru), Onoe Kikugorô VI (Genzô) and Onoe Taganojô III (Tonami). September 1928: Tokizô plays at the Meijiza the role of Okaji in the drama "Natsu Matsuri Naniwa Kagami". July 1930: Tokizô plays at the Shinjuku Kabukiza the role of Kasane in the dance-drama "Iro Moyô Chotto Karimame"; the role of Yoemon is played by Ichikawa Omezô IV. April 1932: Tokizô plays at the Tôkyô Gekijô the role of Chiyo in the "Terakoya" scene of the classic "Sugawara Denju Tenarai Kagami". His stage partners are Onoe Kikugorô VI (Genzô), Nakamura Kichiemon I (Matsuômaru) and Onoe Taganojô III (Tonami). December 1934: the Tokizô - Kichiemon duo performs for the first time, at the Minamiza, the roles of Chidori and Shunkan in the drama "Heike Nyogo no Shima". April 1936: Tokizô plays at the Kabukiza the role of Tonami in the "Terakoya" scene of the classic "Sugawara Denju Tenarai Kagami". His stage partners are Onoe Kikugorô VI (Matsuômaru), Nakamura Kichiemon I (Genzô) and Nakamura Baigyoku III (Chiyo). July 1937: the Tokizô - Kichiemon duo performs for the fourth and last time, at the Kabukiza, the roles of the courtesan Kojorô and the smuggler Kezori in the drama "Koi Minato Hakata no Hitofushi". January 1939: Tokizô plays at the Kabukiza the role of Chiyo in the "Terakoya" scene of the classic "Sugawara Denju Tenarai Kagami". His stage partners are Onoe Kikugorô VI (Matsuômaru), Nakamura Kichiemon I (Genzô) and Ichikawa Omezô IV (Tonami). April 1939: Tokizô plays at the Ôsaka Kabukiza the role of Chiyo in the "Terakoya" scene of the classic "Sugawara Denju Tenarai Kagami". Same casting as in January. May 1943: Tokizô plays at the Minamiza the role Yashio in the drama "Meiboku Sendai Hagi"; the role of Masaoka is played by Nakamura Baigyoku III. January 1944: the Tokizô - Ennosuke performs for the first time, at the Meijiza, the roles of Otoku and Matahei in the drama "Keisei Hangonkô". November 1946: the Tokizô - Ennosuke performs for the final time, at the Minamiza, the roles of Chidori and Shunkan in the drama "Heike Nyogo no Shima". May 1947: revival at the Tôkyô Gekijô of the drama "Jayanagi"; Tokizô plays the role of Nishiki-no-Mae, in reality the spirit of the Snake Willow [more details]. January 1949: Tokizô plays at the Mitsukoshi Gekijô the role of Shigenoi in the drama "Koi Nyôbô Somewake Tazuna". May 1949: Tokizô plays at the Mitsukoshi Gekijô the role of Masaoka in the drama "Meiboku Sendai Hagi"; the role of Yashio is played by Sawamura Tanosuke V.
February 1950: Tokizô plays at the Shinbashi Enbujô the role of Princess Takiyasha in the dance-drama "Masakado"; the role of Mitsukuni is played by Ichikawa Omezô IV. May 1950: Tokizô plays at the Tôkyô Gekijô the role of Masaoka in the drama "Meiboku Sendai Hagi"; the role of Yashio is played by Morita Kan'ya XIV. April ~ May 1951: Tokizô plays at the Kabukiza the role of Yaegiri in the drama "Komochi Yamanba"; the role of Sakata Kurando Yukitsuna is played by Nakamura Kanzaburô XVII. July 1951: premiere at the Kabukiza of Uno Nobuo's drama "Jiisan Baasan"; Tokizô plays the role of Iori's wife Run [casting]. December 1951: Tokizô plays at the Minamiza the role of Yaegiri in the drama "Komochi Yamanba"; the role of Sakata Kurando Yukitsuna is played by Morita Kan'ya XIV. September 1952: Tokizô plays at the Shinjuku Kabukiza the role of Kasane in the drama "Iro Moyô Chotto Karimame"; the role of Yoemon is played by Ichikawa Jukai III. December 1952: Tokizô plays at the Minamiza the role of Masaoka in the drama "Meiboku Sendai Hagi"; the role of Yashio is played by Nakamura Kanzaburô XVII. January 1953: Tokizô plays at the Kabukiza the role of Shigenoi in the drama "Shigenoi Kowakare"; the role of Yasôzaemon is played by Ichikawa Danzô VIII. May 1953: Tokizô plays at the Ôsaka Kabukiza the role of Yaegiri in the drama "Komochi Yamanba"; the role of Sakata Kurando Yukitsuna is played by Morita Kan'ya XIV. June 1953: Tokizô plays at the Kabukiza the role of Masaoka in the drama "Meiboku Sendai Hagi"; the role of Yashio is played by Ichikawa Chûsha VIII. July 1954: Tokizô plays at the Meijiza the role of Princess Takiyasha in the dance-drama "Masakado"; the role of Mitsukuni is played by Ichikawa Ennosuke II. September 1954: his brother Nakamura Kichiemon I dies. March 1955: Tokizô plays at the Ôsaka Kabukiza the role of Shigenoi in the drama "Shigenoi Kowakare"; the role of Sankichi is played by Kataoka Takao. February 1956: the Tokizô - Ennosuke duo plays for the fourth and last time the roles of Otoku and Matahei in the drama "Keisei Hangonkô", which is staged at the Kabukiza. Tokizô also plays the role of Yashio in the drama "Meiboku Sendai Hagi"; the role of Masaoka is played by Nakamura Utaemon VI. April 1956: Tokizô plays at the Kabukiza the role of Miuranosuke in the drama "Kamakura Sandaiki". His stage partners in the roles of Princess Toki and Sasaki Takatsuna are Nakamura Utaemon VI and Matsumoto Kôshirô VIII. February 1957: Tokizô plays at the Kabukiza the role of Fujiya Izaemon in the drama "Kuruwa Bunshô"; the role of the courtesan Yûgiri is played by Nakamura Utaemon VI. Tokizô also plays for the last time the role of Shigenoi in the drama "Shigenoi Kowakare". May 1957: Tokizô plays for the seventh and last time the role of Yaegiri in the drama "Komochi Yamanba", which is staged at the Ôsaka Kabukiza; the role of Sakata Kurando Yukitsuna is played by Nakamura Kanzaburô XVII. November 1958: Tokizô plays for the fifth and last time the role of Masaoka in the drama "Meiboku Sendai Hagi", which is staged at the Kabukiza; the role of Yashio is played by Nakamura Kanzaburô XVII. February 1958: Tokizô plays at the Kabukiza the roles of En'ya Hangan, Okaru ("Gion Ichiriki Jaya") and Tonase (act VIII) in the classic "Kanadehon Chûshingura". March 1958: Tokizô takes part in the final Kabuki performance at the Ôsaka Kabukiza [more details]. Nakamura Tokizô III was an important onnagata and nimaime actor of the twentieth century, excelling in wife roles. He performed female roles on countless occasions in duo with his brother Nakamura Kichiemon I in male roles. He was the head of a large family made up of five sons and five daughters. Nakamura Tokizô III's best roles : Yaegiri ("Komochi Yamanba"), Masaoka ("Meiboku Sendai Hagi"), Sagami ("Kumagai Jin'ya"), Otoku ("Domo Mata"), Urazato ("Akegarasu Yume no Awayuki"), Otoki ("Kiwametsuki Banzuiin Chôbê") and Shigenoi ("Koi Nyôbô Somewake Tazuna").